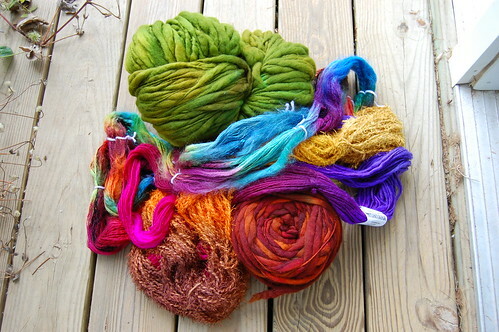 I collected these yarns together last summer with the intention of weaving a shawl. 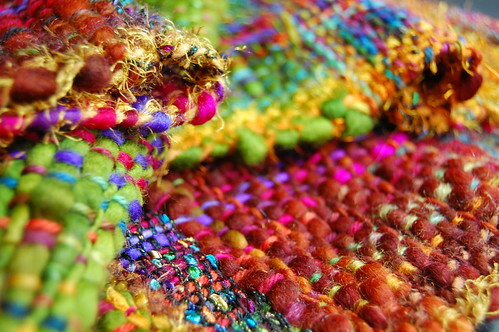 However, due to how different the yarns were from each other, I was too scared to do anything with them... until today! A few hours later (because some of the yarn was really chunky and huge), I was done! 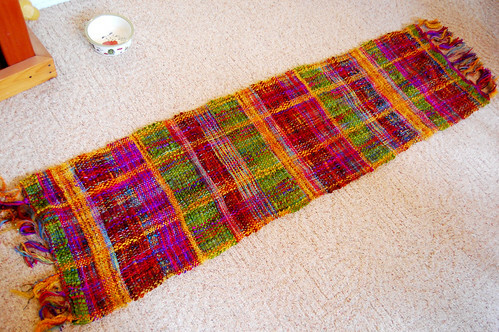 It came out to be about 18 1/2" wide and 64" long. 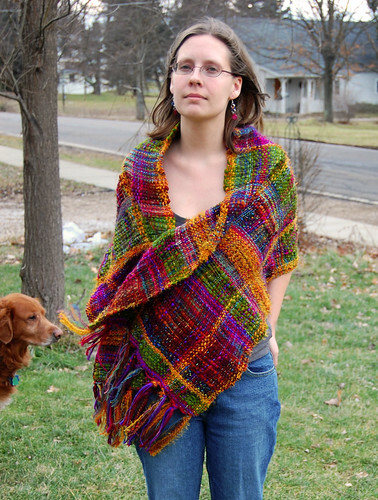 I had the thought that it was going to be so obnoxious and insane that I probably would never wear it, seeing as how I pretty much never wear shawls anyway. I thought I would wind up just hanging it on the wall and making wall art or something. However, even though I don't look real enthused in this photo, I think I love it. There are areas where it looks pretty loose-woven in spots, but fortunately, nothing looks like it's going to fall apart or anything. I just want to snuggle up in it and be a ball of happy. Thanks for looking! That is so jaw-droppingly gorgeous. I love the colors you chose, and how they interact with each other. oh wow. that looks sooo pretty! "I happen to believe in beauty without cruelty." - Gytha Ogg, whilst wearing her very own LIVE tomcat GREEBO for an evening at the opera. As I was looking at the pictures, the same thoughts you typed below went through my head! 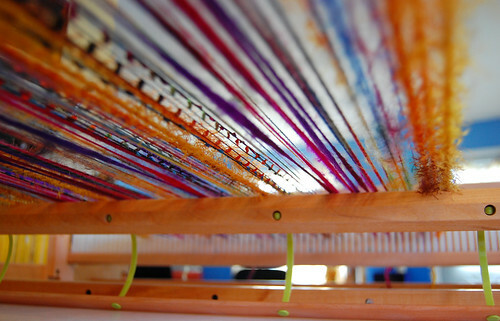 Who would have thought that such diverse yarns could make something so beautiful? I love it. That is the most beautiful shawl I have ever seen. Absolutely fabulous foresight on the yarns going together, just breathtaking!!!!! What a punch of color to see today when we are amidst a blizzard here in Michigan. That scarf is wonderful. 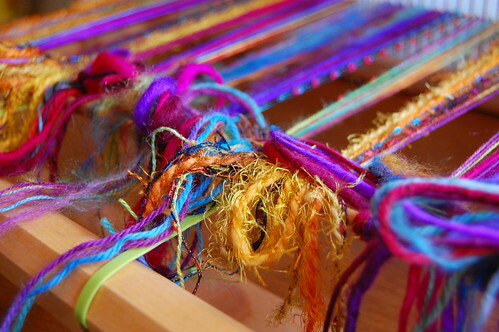 I need to find a loom. 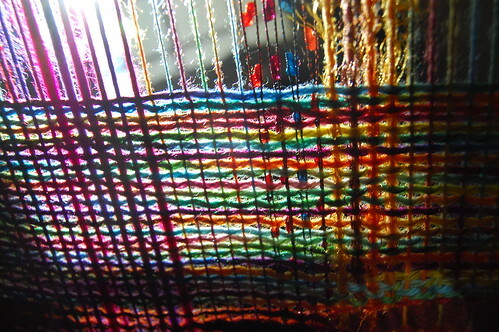 I haven't been weaving for the last three years. I'm inspired.